Be gentle when cleaning the kitchen Cabinets! Use the mildest cleaning solution that will successfully clean your cabinets. Stronger products may damage or discolor your cabinet finish and are not recommended. After cleaning, wipe all surfaces with a clean, damp cloth. Dry immediately, using another soft, clean cloth. Silicone-based cleaning, waxing, or polishing products. 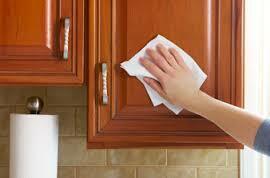 Avoid draping damp clothes or dishtowels over cabinet doors. This moisture can cause permanent damage — such peeling and discoloration — to the cabinet’s finish. This entry was posted in Designer's Journal and tagged 19008 kitchens, Bryn Mawr kitchen remodel, cleaning cabinets, kitchen cabinets, kitchen cleaning, kitchen design on November 1, 2015 by admin.